There is no telling when disaster will strike! Be prepared for the worst with one of our emergency blankets. These blankets can be used to keep you warm or act as a signaling device, and are most commonly used for emergency first aid and wilderness survival. These little wonders have a multitude of other uses, making them perfect for 72 hour and first aid kits! 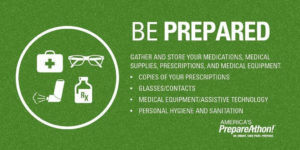 There is no better time than NOW to prepare for an emergency. We have found a wonderful resource from the Department of Homeland Security. called Ready. Their website ready.gov is part of a National public service campaign designed to educate and empower the American people to prepare for, respond to and mitigate emergencies, including natural and man-made disasters. Ready and its Spanish language version Listo ask individuals to do four key things: (1) stay informed about the different types of emergencies that could occur and their appropriate responses (2) make a family emergency plan and (3) build an emergency supply kit, and (4) get involved in your community by taking action to prepare for emergencies.